Funds finally released for Super Falcons after Buhari intervention. 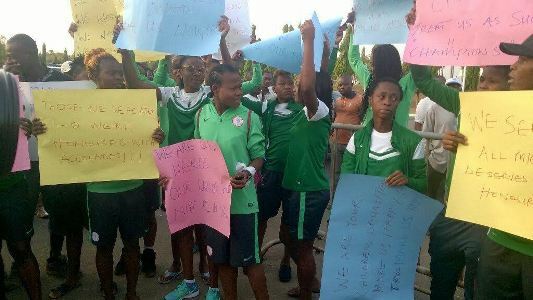 The disgraceful saga of the Super Falcons allowance payment has finally come to an end after the Federal Govt on the orders of President Buhari today released the sum of N471.8 million to pay them and Super Eagles following their AWCON 2016 win and 2018 World cup qualifiers respectively. at N305/$ to Nigeria Football Federation. It has been a really sad development and i still can't believe what they have put our players through.I am sure by now their victory has become a bitter sweet pill for them.When you have to fight tooth and nail for what is rightfully yours,when you eventually get it,the feeling is not the same. As you read this,would you allow your kids to represent Nigeria if you had the choice of another country?I seriously doubt you will say yes. The Minister of Finance, Kemi Adeosun, approved the payment, which is a sum of N358 million for the Super Falcons while the sum of N113.8 million has also been released by the Office of Accountant General of the Federation for the Super Eagles. The players will be paid today, Friday. Sadly,this will not be the last time something like this happens.Have you forgotten the embarrassment of the Olympics?Missing the flight?Getting to Brazil on the very day they were due to play?Having a foreigner compensate our boys?